There are 3 things Lesotho is not short of, Water, Rocks and Mountains. Mix all these together and you have a recipe for some stunning scenic 4×4 trails. Ford Motor Company South Africa recently decided to put the All New Ford Ranger through its paces in the mountain kingdom. Ford’s Fleet department decided to launch the New Ranger to their most valued customers at Maliba Mountain Lodge. The unique terrain and scenery was exactly what was needed to showcase Ford’s latest offering to its fullest. In order to accommodate all their corporate and government clients the launch has been split up over 4 rotations. The first two happened during November and the remaining two are scheduled for early 2012. With the help of Red Moon Conferences and Incentives; clients were sent on a mountainous adventure, with scenic routes planned, border papers organised and fantastic accommodation booked! 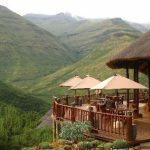 All the guests were overwhelmed by Maliba Mountain Lodge, the stunning scenery and friendly people of Lesotho. For all the car fanatics, please visit www.ford.co.za for full specifications and prices. The photos show these great vehicles in action on the demanding territory that only Lesotho can offer.